Pit firing and saggar firing are forms of a style of firing processes called Atmospheric. 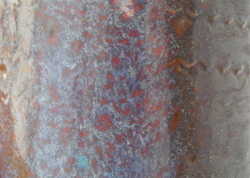 Meaning the air around each piece has a key impact on how each vessel turns out. These processes include pit firing, some saggar firing as mentioned above, but also raku, soda firing, salt firing and wood firing. 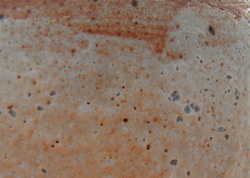 The reason only some of the saggar firings are included is some potters use the saggars as they were originally intended. The saggar is in place to protect the finish from the atmosphere in the kiln. It’s a cosmetic thing. How much difference can the air in the kiln make? It’s not just the air, but more what’s in the air. In the case of wood firing, wood is typically the main source of fuel (duh!) and the potter hopes to get the wood ash into the kiln where it will settle and stick on the vessels. The potter wants the air in the kiln to be totally polluted with wood ash to get the results he searches for. Salt and soda firing typically uses propane or natural gas as a fuel, and the salt or soda is introduced into the kiln at a specific temperature(s) where it vaporizes and clings to the vessels inside altering their appearance. 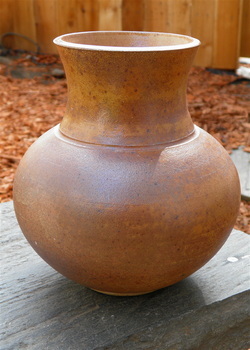 Potters who specialize in wood, soda, or salt firing have set firing schedules they follow to get consistent results. These schedules help them remember how fast or slow they need to raise the temperature, when to add the soda or salt (if needed) and how much, how long to let the kiln fire, plus many other factors. The atmospheres are dramatically impacted by what’s in the air. 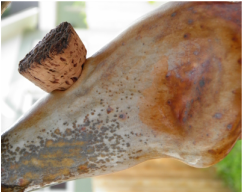 Wood, salt and soda firing are in relatively the same temperature ranges, so it is not the temperature; it’s what is in the air! Below are examples to show the difference in the atmosphere. In the first set of photos, the clay body is the same, pots are roughly the same size and weight, and thrown by the same pottery (me). Both entered the kilns without any glaze and were affected by the atmosphere only. The piece on the left was fired in a wood kiln and was exposed to lots of wood ash. 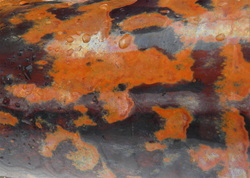 The piece on the right was fired in a salt kiln and was exposed to the salt vapor. Notice the difference in the color, in this process the piece in the salt firing is much richer and the coloring is more complex. 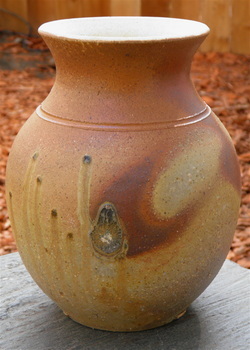 The wood firing was on the lighter side, but the ash did produce some green dripping along one side. Next let’s look at a glaze comparison. 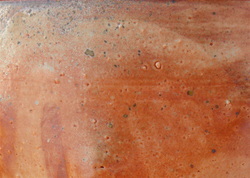 The pieces in this section are all the same clay body and fired in two different reduction atmospheres. A reduction atmosphere is a period in the firing cycle where the potter reduces the oxygen in the chamber. The photos on the left are wood fired, the photos on the right are gas fired. The top two photos share the same glaze, as do the two in the bottom two photos. Notice the difference between the glazes adding wood ash to the air, changing the atmosphere. Now to really mess with your mind, the photo below on the left is Glaze A (Fig 3&4). 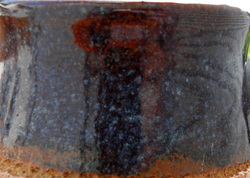 The photo on the right is Glaze B (Fig 5&6). They were wood fired with a change in the reduction (oxygen deprivation), thus changing the atmosphere. You can see the many variations you can do by changing the atmosphere.